America’s overall image around the world remains largely positive. Across the nations surveyed (excluding the U.S.), a median of 69% hold a favorable opinion of the U.S., while just 24% express an unfavorable view. However, there is significant variation among regions and countries. The U.S. receives largely positive reviews among many of its key NATO allies. About two-in-three Canadians have a favorable opinion, as do large majorities in Italy, Poland, France, the UK and Spain. The outlier is Germany, where just 50% give the U.S. a positive rating, while 45% express a negative one. America’s image has become more negative in Germany over the last few years – as recently as 2011, 62% of Germans gave the U.S. a favorable review and only 35% assigned a negative rating. In conflict-ridden Ukraine, 69% have a positive opinion of the U.S., although there are notable differences between the western (78%) and eastern (56%) regions of the nation. (For more on Ukrainian public opinion and the methodology for our Ukraine survey, see this recent report). The conflict has led to a dramatic increase in anti-American sentiments in Russia. Only 15% of Russians have a positive view of the U.S. today, down from 51% two years ago, before the outbreak of violence. Roughly eight-in-ten Israelis see the U.S. in a positive light, although there is a wide gap between Israeli Jews (87% favorable) and Arabs (48%). Elsewhere in the region, America’s image is largely negative, with most Jordanians, Palestinians, Turks and Lebanese registering an unfavorable opinion. Still, positive ratings for the U.S. in Turkey have increased by 10 percentage points in the last year (from 19% to 29%). And in Lebanon, views divide sharply along religious lines: A slim 55%-majority of the country’s Christians have a positive opinion of the U.S., as do 48% of Sunni Muslims. Only 3% of Lebanese Shia Muslims share this view. America’s image is mostly positive among the Asian nations polled. Particularly large majorities see the U.S. favorably in the Philippines (92%), South Korea (84%) and Vietnam (77%). And following a year in which President Obama visited India, and Indian Prime Minister Narendra Modi came to the U.S., America’s image in that country has improved significantly, jumping from 55% favorable to 70% today. Positive views of the U.S. have declined slightly in China, however, dropping from 50% to 44%. Pakistan is the one Asian nation surveyed where a majority gives the U.S. a negative rating, although favorable views have become somewhat more common over the last year (22% today, 14% in 2014). Views of the U.S. remain largely favorable in Latin America. As Brazilian President Dilma Rousseff prepares to visit the U.S., fully 73% in her country give the U.S. a favorable review, up from 65% a year ago. And even though Argentina is the only country surveyed in the region where less than half hold a positive view, ratings for the U.S. have nonetheless improved since 2014 (43% now vs. 36% a year ago). The opposite is true, however, in Venezuela, where President Nicolás Maduro has engaged in considerable anti-American rhetoric in the past year. Only 51% of Venezuelans now rate the U.S. favorably, down from 62% in 2014. There are deep ideological divisions in Venezuela, with 73% of those on the political right giving the U.S. positive marks, compared with 44% of those in the center and just 21% among those on the left. As has largely been the case since the Pew Research Center began polling in sub-Saharan Africa in 2002, America’s image is positive in the region. In all nine African nations surveyed, more than seven-in-ten have a favorable opinion of the U.S. And in Uganda (+14 percentage points), Ghana (+12), Nigeria (+7), Senegal (+6) and South Africa (+6) the percentage of people expressing this view has increased significantly since last year. In 22 of 39 nations, young people express significantly more favorable attitudes toward America. For instance, 59% of 18-29 year-olds in China have a positive opinion about the U.S., compared with just 29% of those ages 50 and older. Notably large gaps are also found in Vietnam, Brazil, Mexico, Poland, Ukraine and Venezuela. There is extensive global support for the U.S. military campaign against ISIS. A median of 62% across the nations polled say they support American military efforts against the militant group in Iraq and Syria, while a median of just 24% are opposed. Fully 80% of Americans back the campaign against ISIS, including large majorities of Republicans (88%), Democrats (80%) and independents (75%). Across the border, roughly two-in-three Canadians support the military action, as do solid majorities in the EU nations surveyed. The campaign also has support in the Middle Eastern nations surveyed, even in some countries where the U.S. and many elements of American foreign policy have been unpopular in recent years. More than three-in-four support the American military actions in Lebanon and Jordan, both of which share a border with Syria. Palestinians and Turks are also, on balance, supportive. Meanwhile, fully 84% of Israelis support the strikes against ISIS, including 87% of Jews and 69% of Arabs. Turks and Jordanians were also asked whether they favor or oppose their own countries being a part of the coalition to fight ISIS in Iraq and Syria. Overwhelmingly, Jordanians are willing to join the coalition (76% support, 21% oppose). However, a plurality of Turks say their country should stay out of the coalition (36% support, 44% oppose). American’s military efforts against ISIS receive support throughout most of the nations polled in Asia and Africa, although there are a couple of notable exceptions – on balance, the Malaysian public opposes these efforts, and Senegalese are essentially divided. In several countries a relatively high percentage of respondents do not offer an opinion. The strongest opposition to America’s campaign comes from Russia, where 67% oppose it. And aside from Brazil, public opinion in Latin American leans against U.S. efforts. This is especially true in Argentina, the only country other than Russia with a majority (62%) in opposition. There is considerable opposition to the American government’s use of interrogation methods that many consider torture in the period following the September 11, 2001 terror attacks. A median of 50% across the nations surveyed say using these methods against suspected terrorists was not justified, while only 35% believe they were justified. Opposition is strong among some of America’s top European allies, with majorities in Germany, Spain, the UK and France saying these methods were not justified. Italians, however, are roughly divided on this issue, and Poles lean towards saying the interrogations were justified. In every EU nation surveyed except Poland, those on the ideological left are more likely to be opposed than those on the right. Outside of Israel, there is relatively little support for the post-9/11 interrogations in the Middle East. Most in Asia also say these techniques were not justified, although Filipinos and Indians tend to be supportive. Opposition is consistently strong in Latin America, while Africa is the one region where public opinion tends to favor the harsh methods. 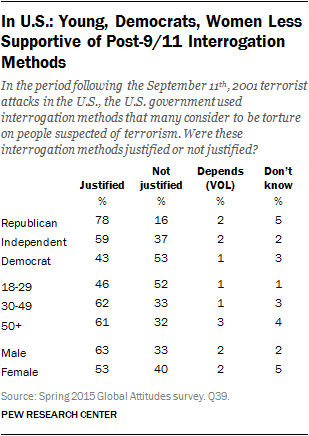 Most Americans believe the post-9/11 interrogations were justified, but there are sharp divisions along partisan lines, with Republicans much more likely than others to say they were justified. There are also significant age and gender gaps. Although many around the world take a grim view of the harsh interrogation policy America pursued in the wake of the September 11 attacks, the U.S. continues to receive strong marks for respecting the individual liberties of its own citizens. Across the nations surveyed, a median of 63% believe the American government respects the personal freedoms of its people, while just 22% say they do not believe this. There are, however, some exceptions. Public opinion is roughly divided on this question in Russia, Turkey and Argentina. And the U.S. actually gets some of its most negative ratings on this issue in Europe. Germany is the only country in the survey where more than half say the U.S. does not respect personal freedom. This view has become increasingly common among Europeans over the last two years. Critical views of the U.S. government on this issue have also become more common among Americans themselves. Barely half in the U.S. (51%) think their government respects individual freedoms today, down from 63% last year, 69% in 2013 and 75% in 2008, the first time the question was asked. This view is more common among Democrats (62%) than Republicans (50%) or independents (42%). Half or more in 29 of 40 countries surveyed say they have confidence in President Obama to do the right thing in world affairs. Throughout his terms in office, Obama has received particularly strong ratings in Europe and Africa, and that continues to be the case this year. Majorities in every EU and sub-Saharan African nation surveyed give him positive marks. He is also largely popular in Asia, although Pakistan is an exception, and he gets mixed reviews in China. 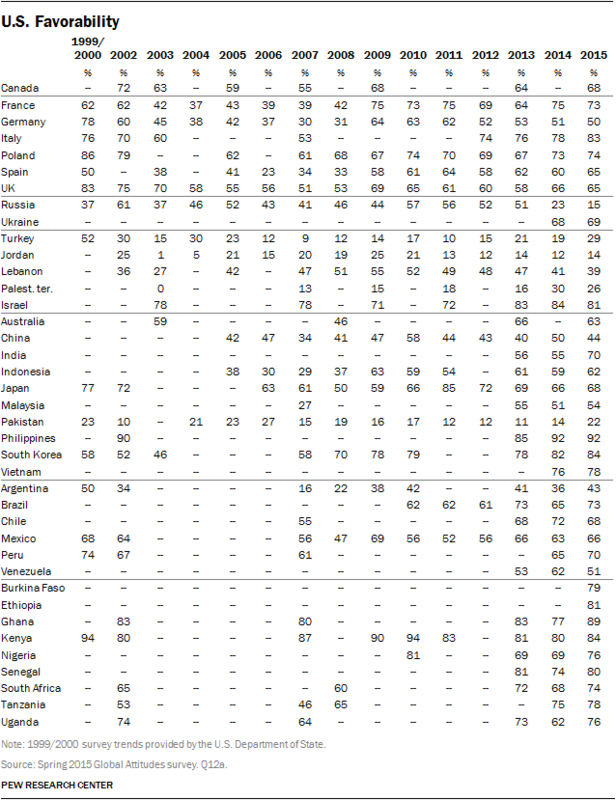 Half or more rate Obama positively in the Latin American nations of Brazil, Chile and Peru. But his ratings are mixed in Mexico, on balance negative in Argentina and overwhelmingly negative in Venezuela. Meanwhile, Obama’s image in the Middle East is mixed or negative, with more than eight-in-ten Jordanians and Palestinians giving him poor marks. Overall, Obama’s image has improved in the last year. In 14 countries of the 36 countries where trends from 2014 are available, more people now say they have confidence in the U.S. president. The largest gain occurred in India, which Obama visited in January. Almost three-in-four Indians express confidence in Obama, up from 48% a year ago. Double digit gains are also found in Ghana (+22 points), Turkey (+21), Nigeria (+20), Uganda (+11) and Brazil (+11). The biggest decline by far in Obama’s rating took place in Israel. Currently, 49% of Israelis are confident in his leadership of international affairs, down from 71% in 2014. Among those who identify with Benjamin Netanyahu’s Likud Party, just 40% have confidence. The president’s ratings are also down 7 percentage points in both China and Venezuela. The harshest assessments of Obama are found in Russia, where 86% say they lack confidence in the American president. This is up slightly from 80% in 2014, and up steeply from 51% in 2013, before the Ukraine crisis. When respondents are asked to rate President Obama on issues, he receives his most positive reviews for his handling of global economic problems. Across the 40 nations in the survey, a median of 52% approve of how he has dealt with this issue, while just 28% disapprove. He also receives relatively good marks on climate change, although in 12 of 20 countries where trends from 2010 are available, fewer people now think he is handling this issue well, including significant declines in the five EU nations that were surveyed in both years. On balance, global publics tend to approve of how Obama is dealing with ISIS. His ratings on this issue are mostly positive among American allies in Europe: Across the six EU member states polled, a median of 51% approve, while 38% disapprove. In the Middle East, most Lebanese (66%) and Jordanians (56%) say they approve, but majorities in Israel (55%) and the Palestinian territories (59%) disapprove. On his handling of China, Iran and North Korea, the U.S. president receives mixed reviews. 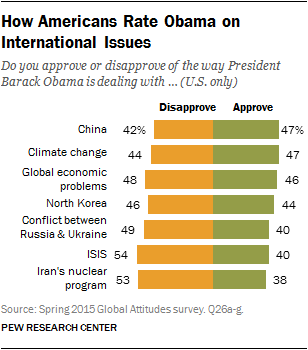 Six-in-ten Chinese disapprove of how Obama is dealing with their country. Meanwhile, when asked to rate how he is dealing with Iran’s nuclear program, eight-in-ten Israelis disapprove. A global median of 39% give Obama negative marks for how he has dealt with the conflict between Russia and Ukraine, while 33% rate him positively. Fully 90% of Russians say they disapprove. In Ukraine, opinions lean slightly toward a negative assessment: 38% approve of how Obama is dealing with the conflict, while 43% disapprove. However, 44% of those living in the western part of Ukraine approve of the U.S. president’s actions, while only 31% in the east agree. Among Americans, there is no issue where Obama gets majority approval. He gets his highest ratings for dealing with China, climate change and global economic problems. His poorest reviews are on dealing with Iran’s nuclear program. As might be expected, there are large partisan differences on each of these evaluations.